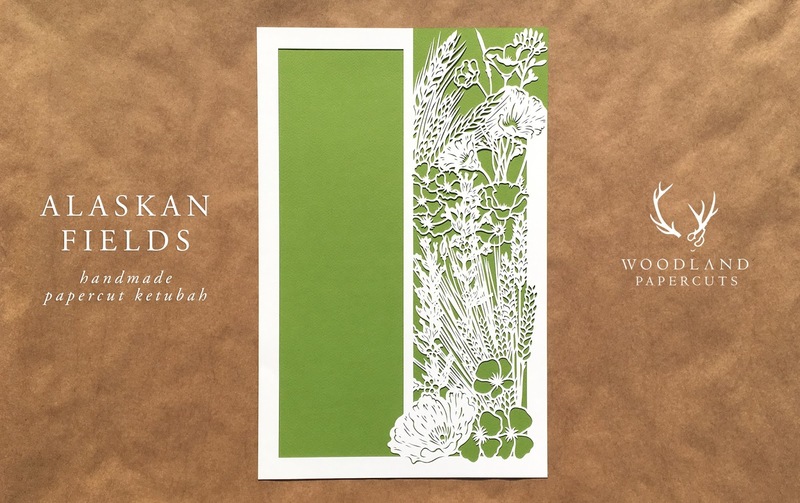 As wedding keepsakes, my papercut ketubot are often bought as gifts by family and friends of the happy couple. Sometimes, even as a surprise gift by bride or groom to their counterpart (for example, these anniversary ketubot). In 2017 I had many orders who were purchased by grandparents, best friends, and parents such as Alison - who commissioned a special keepsake for her son and new daughter-in-law's wedding celebration. James & Melanie were already married in the bride's home country of Switzerland where they both lived, but they were moving back to England and throwing a second wedding celebration. Alison really wanted to gift them with something at their wedding that would represent all that shared history and future. She chose a poem that was meaningful to the couple (and which they asked her to read at the ceremony), and gave me some details about the couple's story and which of my past work she liked and why. 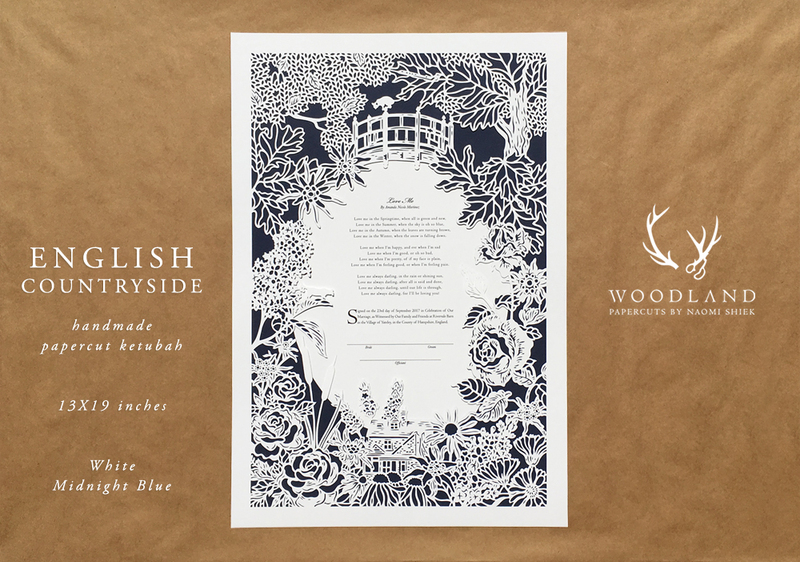 Armed with that information I designed this ketubah full of symbolic elements, such as the iconic bridge from their wedding venue, the national flowers of both England and Switzerland, their two cats, a small portrait of their new family home, and yes- that's a small airplane hidden in the foliage (the groom is a pilot)! Each element has a reason for being there, mirroring the occasion on which this gift be presented to the couple. The ketubah was a huge success and the talking point of the day, as well as the following morning, when the whole family met again for breakfast. We put the ketubah on display so everyone could see it and I could explain all the details. Thanks again for making such a stunning gift, everyone without exception was amazed at your creativity! It will hang on the wall in James and Melanie’s home as a reminder of a truly beautiful wedding. 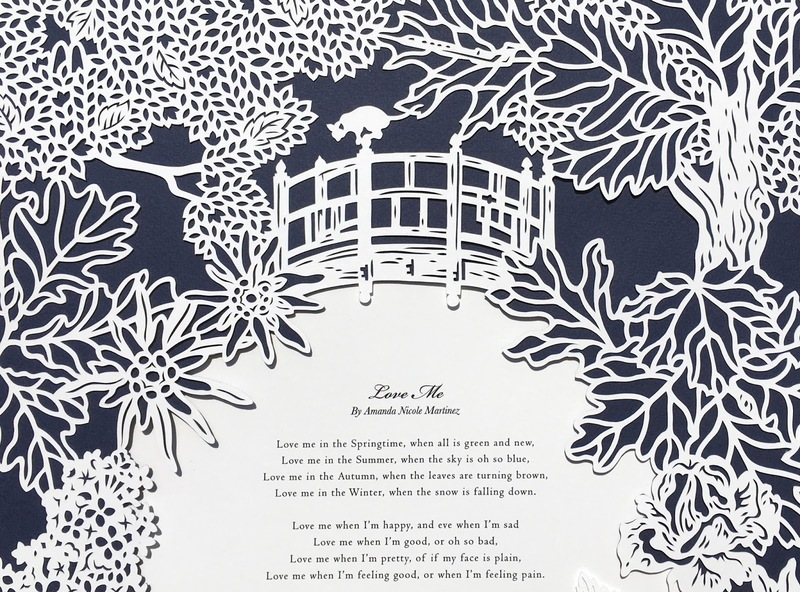 Another commission gift is Aaron's, who wanted a small papercut to fit text he'll scribe himself for his first wedding anniversary (have I mentioned that the first wedding anniversary is PAPER?). He had a clear vision of what he was looking for, so the consultation was really straightforward. In fact the only difficulty was delivering the finished piece, as they live in a remote region somewhere in the Canadian arctic tundra. 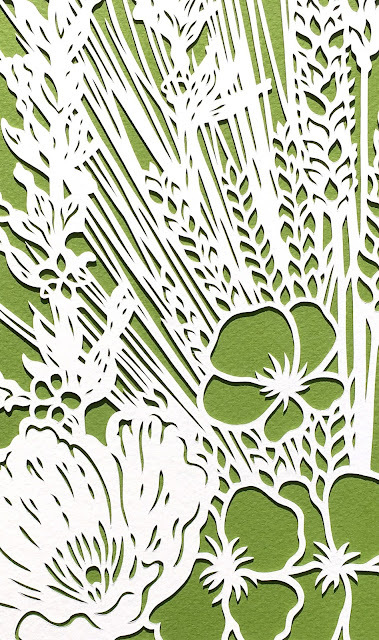 I feel like a little piece of me goes with every papercut, so it was quite exciting to me to think a small version of me will go that far! Aaron was ok with waiting, "after all, I stretched out my proposal to my wife over 12 days ... so she can be patient too."